Admittedly I am a cookbook addict and when I find a new cookbook that captures my attention for more than a week I know that I have found a good book. Such is the case with David Rocco’s, Made in Italy . I am working on cooking my way through the entire book of 140 recipes featuring simple rustic food. 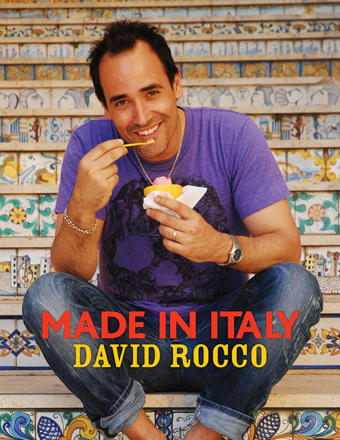 I had no idea that David had a cooking show on TV when I purchased his book at the Feltrenelli Bookstore on Via del Babuino. I liked the cover and I liked the pictures. Leafing through the book I saw many of the dishes that I have come to love eating and was hopeful that I would be able to remake many of them when I returned to Maryland. I wasn’t disappointed! 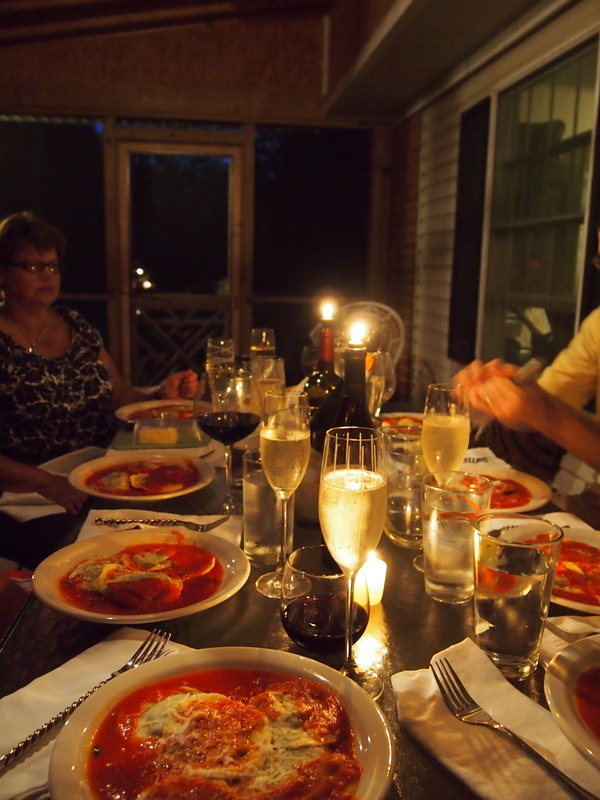 There is a saying that cooking is good for the soul and this is definitely the case when cooking italian food. Whether you are cooking for a special occasion, for family, for friends or in this case trying something that you have seen often but have never tried before. Inspired by watching one to many Detective Montalbano episodes Joe and I decided to get to it!! 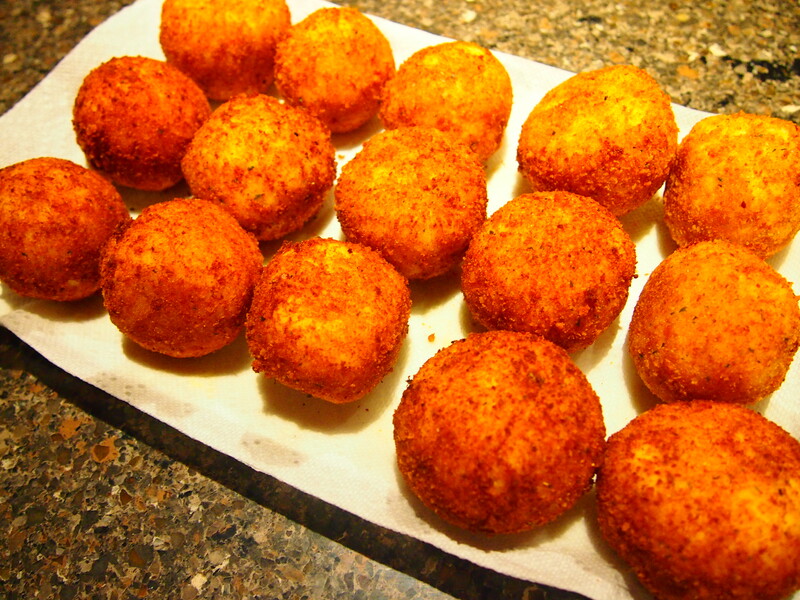 Arancini di Riso (Sicilian Rice Balls) – the Arancini because the size and color of the finished rice balls approximates an orange – is a typical sicilian dish of fried rice balls that have assorted. Typical for italian recipes there are almost as many versions as there are sicilian grandmothers, however I prefer recipes that include some type of meet ragu for the filling. To make the filling heat the butter and olive oil in pan. Cook for approximately 5 to 8 minutes until onion is translucent. Add ground meat and cook through. Add wine and cook for approximately 5 minutes. 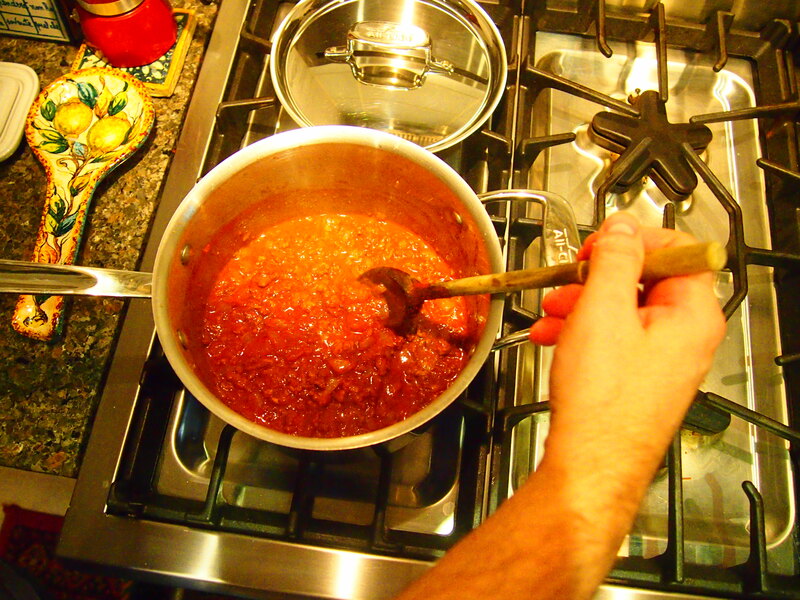 Add tomato paste and cook to reduce about 10 to 15 minutes stirring often. Season with pepper and add peas and take off heat. Stir a few more times and then leave to cool. 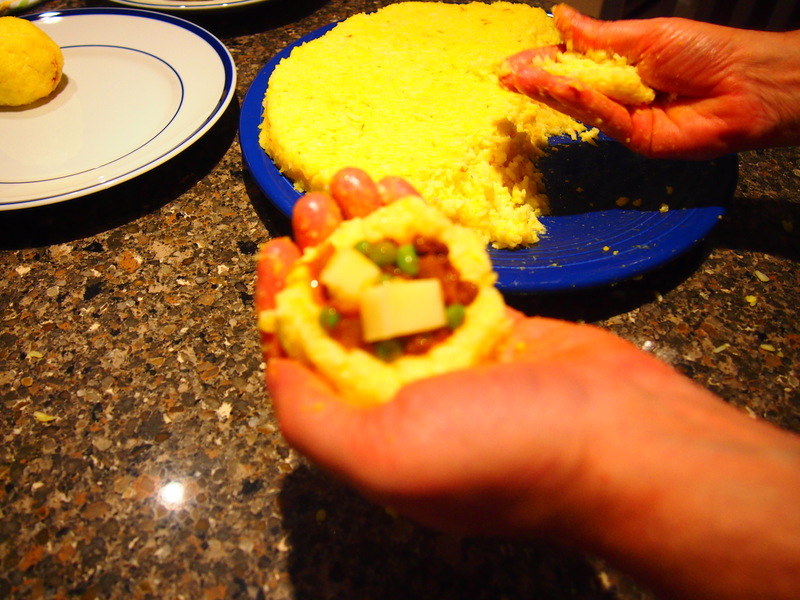 Filling should be thick and not to runny. To make the rice cook rice per instructions on package. 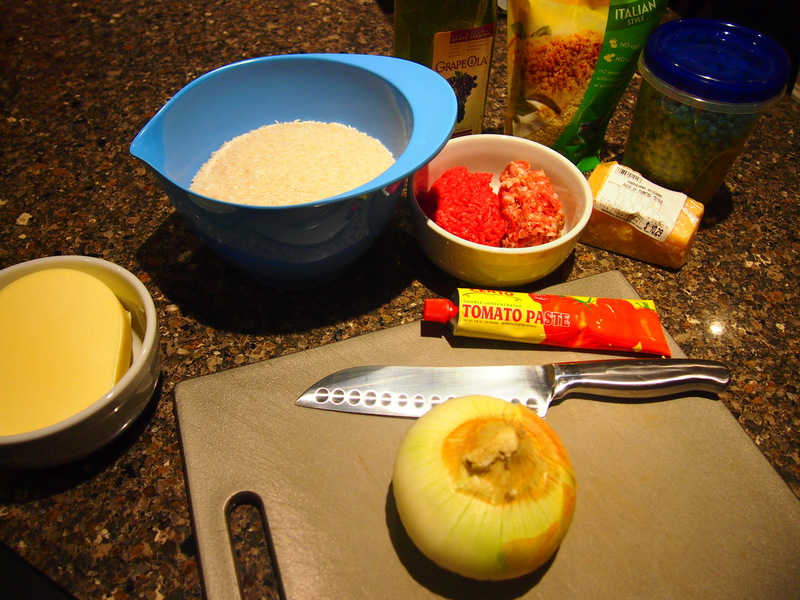 Remove rice from pan to large bowl and add saffron, butter, grated cheese, egg yolks, and salt and mix throughly. When finished spread rice out on large flat plate. Watch the video for this part as the visuals are so much better than any explanation I can offer. This entire process took about 2 hours and was much easier than we initially thought. The result – DELICIOUS!!! Buon Appetito! This recipe is one of my favorites. Their sweet and sour flavor makes them perfect for pairing with – pork roast, sandwiches, as part of your antipasto, and they are perfect all by themselves on top of a crusty baguette. You can serve them warm right out of the pan or at room temperature. Easy to prepare filling your house with a wonderful aroma they last for a long long time in the refrigerator – I usually double the recipe. While most any pepper will do and bell peppers seem to be the staple at the grocery store try to experiment with different types of peppers – the sweeter the better. At the farmer’s markets I look for the Cubanelle Peppers (typically long slender red peppers) which are especially sweet. 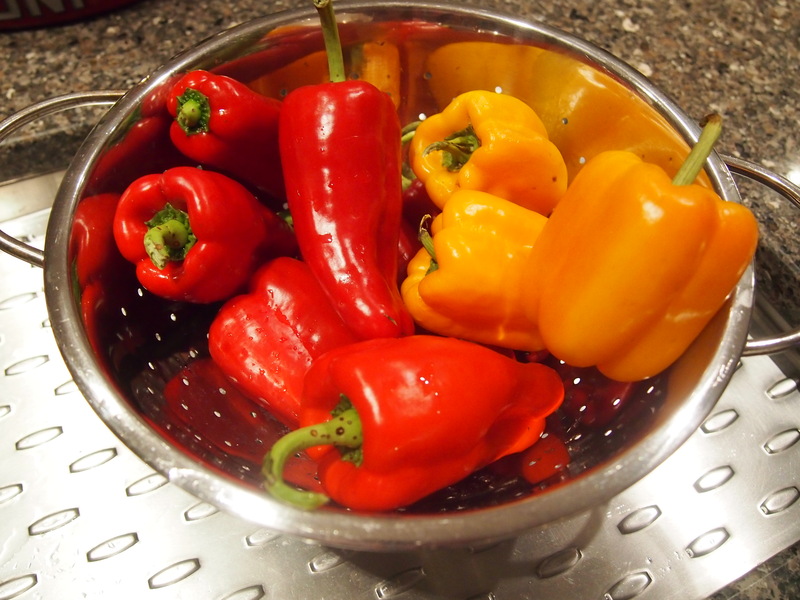 Add peppers and ½ cup water and season with salt and pepper. Cook, partially covered and stirring occasionally, until peppers are soft, about 1 hour. About 20 minutes if you have roasted the peppers first. As is the case with most italian food I always find these better the next day or several days later. Easily made in advance and have on hand for later. Buon Appetito! 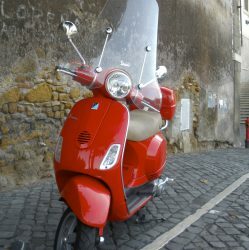 Safe travels to all the vespa chasers – keep dreaming!!!!!!!! 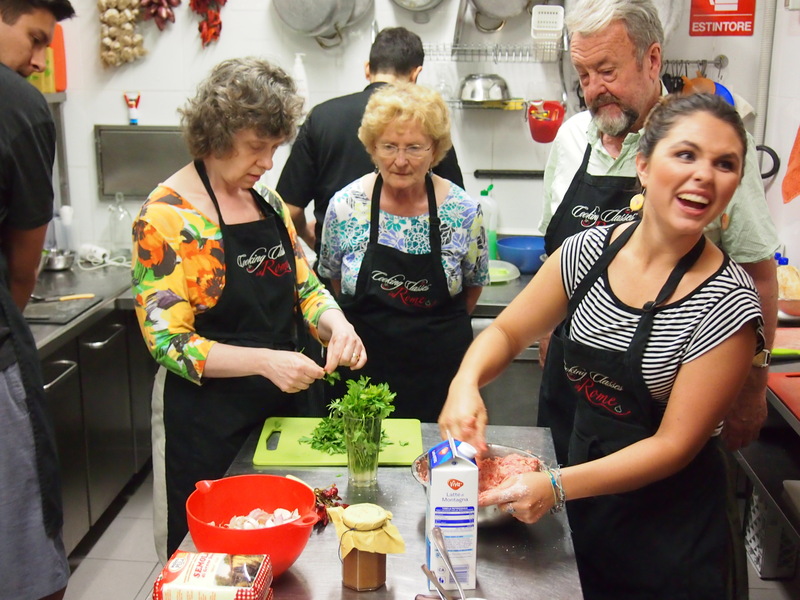 One of the most rewarding experiences you can have in Rome is takeing a cooking class. Meeting liked minded foodies from around the globe and preparing and sharing a meal is enormous fun and hopefully an adventure that you will bring home and share with your friends. WARNING: It can be addictive! 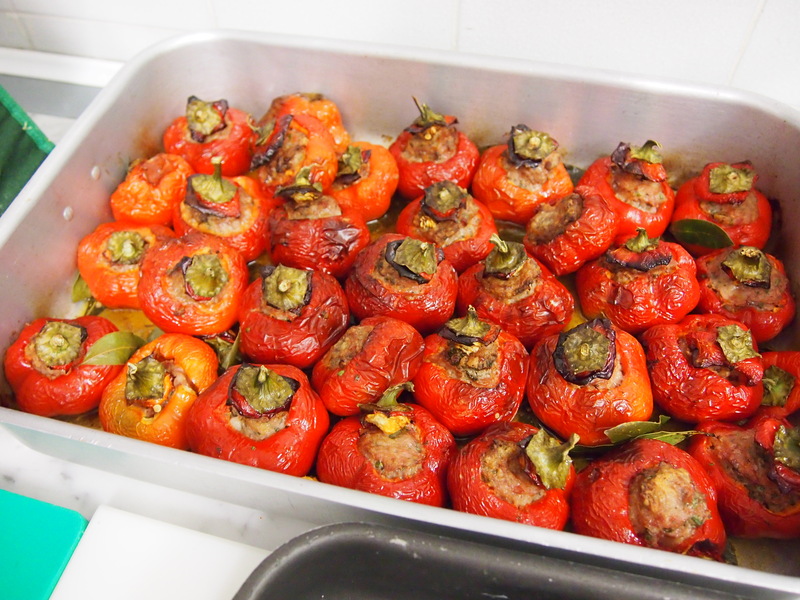 On my fourth class with Chef Andrea we prepared a menu of stuffed figs, homemade cavatelli with pesto, stuffed peppers, sauteed cauliflower, and a pear torte. My favorite recipe from this particular class is below and fairly easy to make. To prepare the filling mix sausage, parmesan cheese, eggs, grated cheese, leftover bread soaked into milk, salt and pepper. Mix all the ingredients well and set aside for a good half an hour to let the flavors meld. 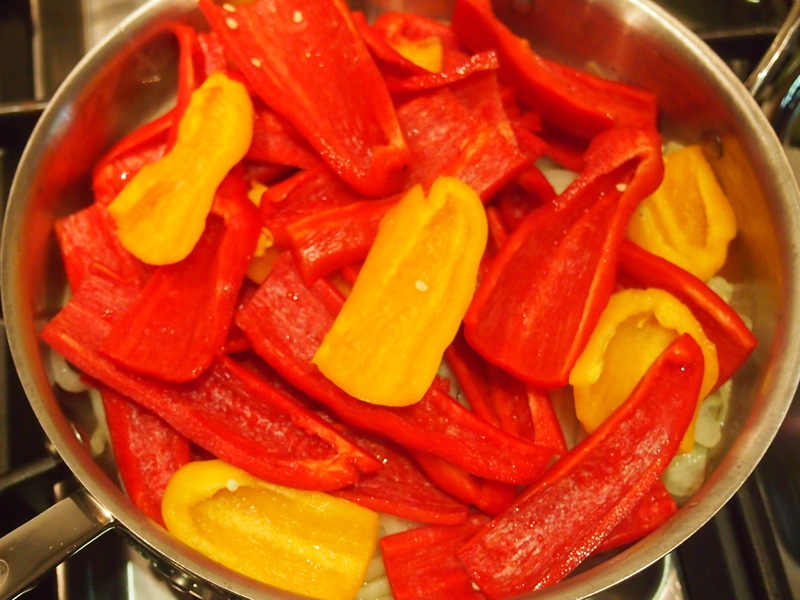 Stuff the peppers one by one and place onto a baking dish, replacing the small piece you cut from each pepper on top. Add a little bit of water and extra virgin olive oil to the bottom of the pan to avoid burning the peppers. Cook for about 15 to 20 minutes depending on the size of the peppers, until cooked all the way through. 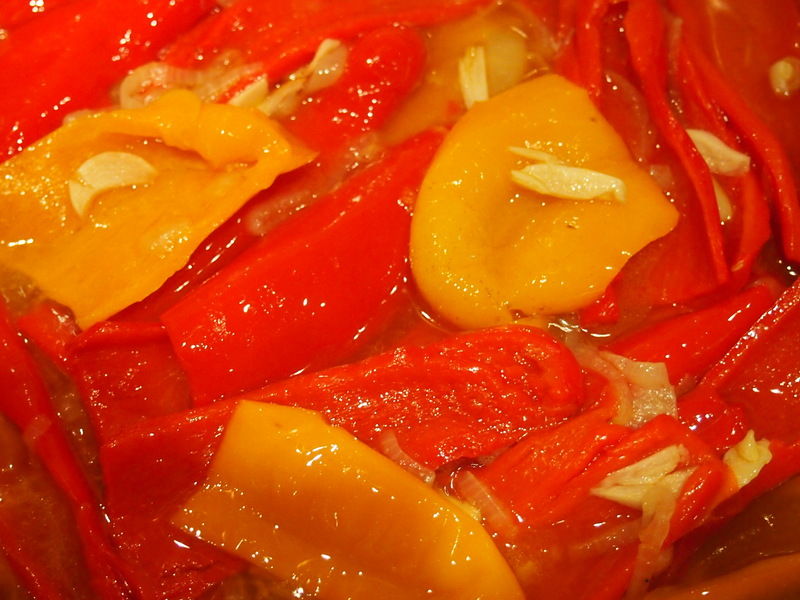 Turn the pan carefully in the oven once or twice to ensure even cooking all the way through the peppers. Serve hot. Buon Appetito! I suppose I never gave much though to where capers came from except to say off the shelf of my local Italian Grocer. In the back of my mind I thought in some way they were related to olives and must be cultivated in the same way. 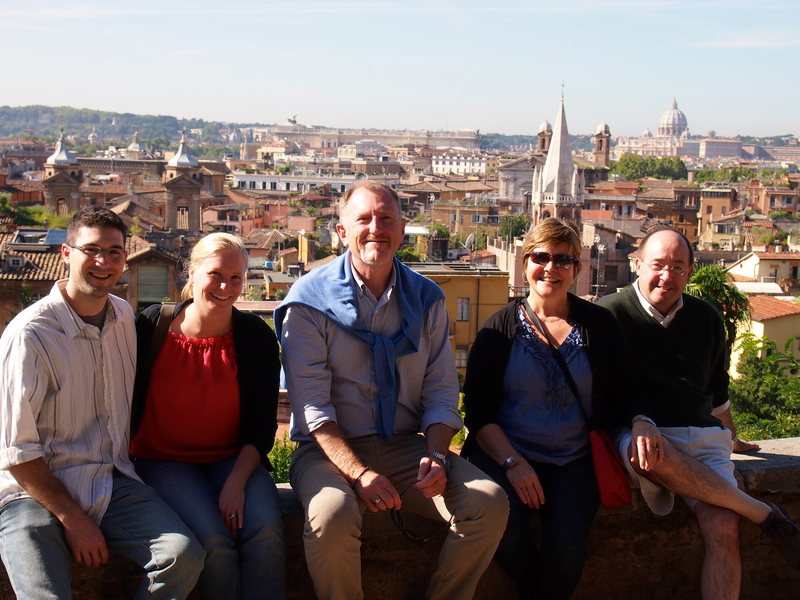 Well, I have certainly been learning a lot on this trip to Rome! The discoveries that await you in Rome are multi-layered to say the least. On a recent walk around the walls of Vatican City I was amazed to discover that one of my favorite ingredients for cooking, capers, grows willy-nilly in the cracks and crevices of just about every surface in this city. 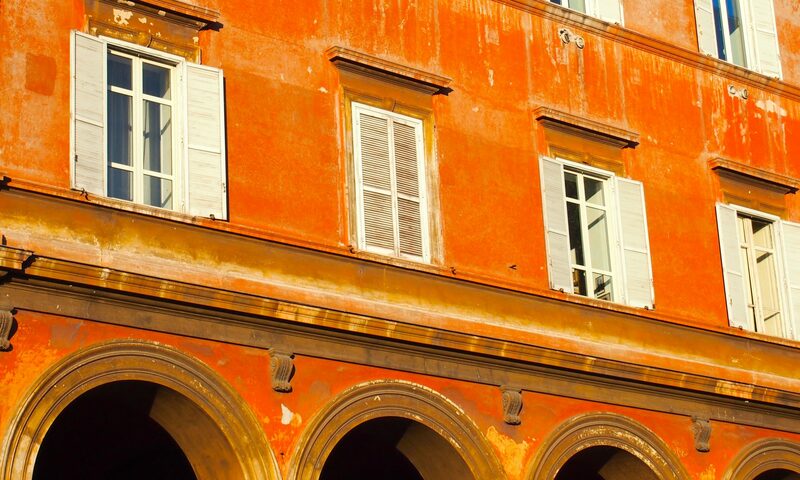 Just look up as you walk pass by a stone wall, under an arch, or as you visit some of the most famous landmarks in the Eternal City. You will undoubtedly see a caper plant. 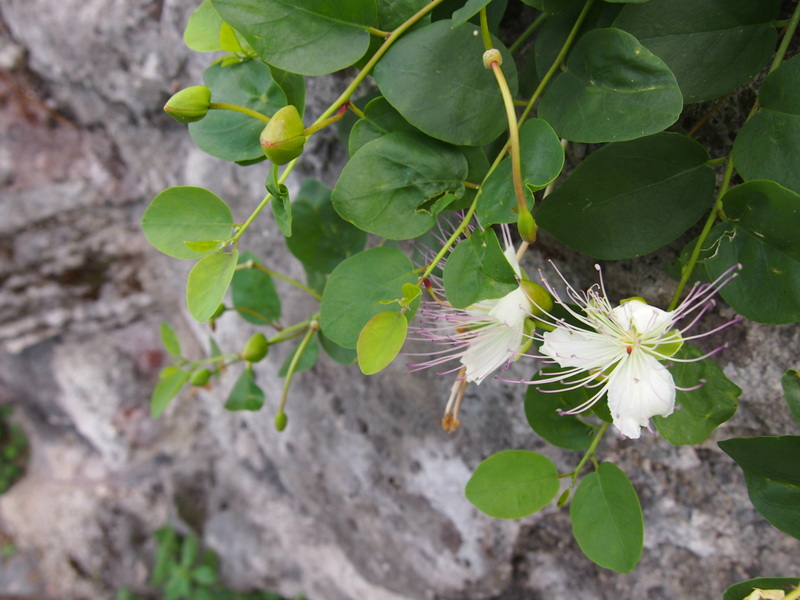 All these wild capers are not looked upon with favor as they wreak havoc on the surfaces in which they grow, however I certainly find them intriguing! 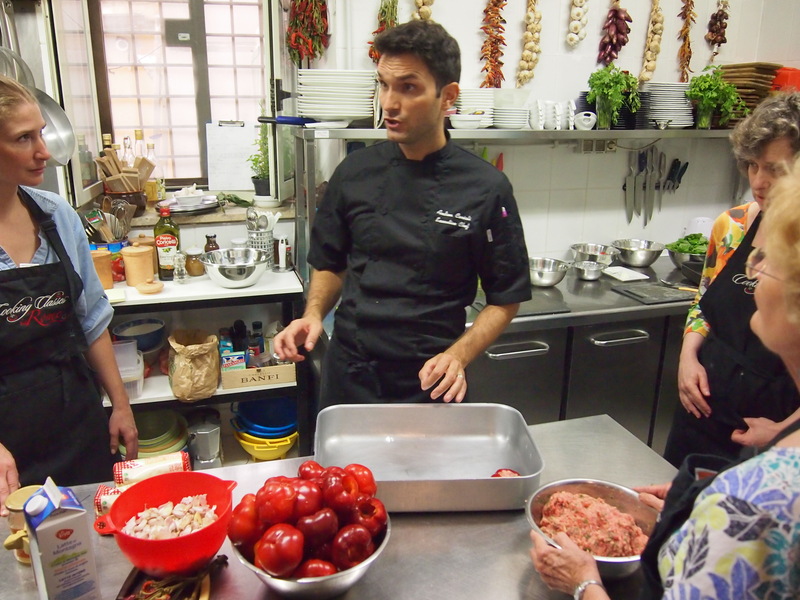 One of the best adventures you can have in Rome is to take a cooking class. You meet interesting people from around the globe, have a wonderful shared experience, and you get to eat what you make. WARNING: It can be addictive! One of the most intimidating foods for me was pasta. It is an investment of time and you need the proper equipment. Like most things the investment is worth it! I had tried and tried at home but to no avail. 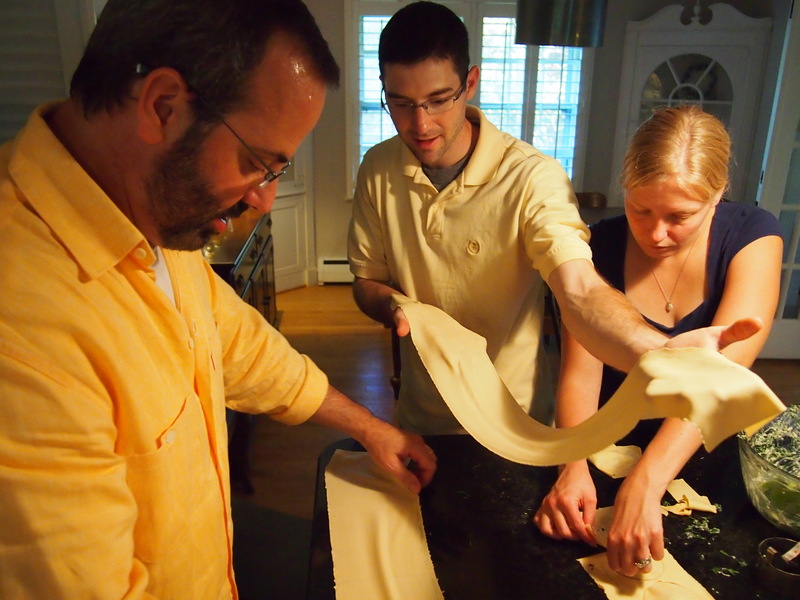 I am a visual learner and will always be grateful to Andrea for showing me the proper way to prepare delicious pasta. The following recipe is easy to make and I know you will not only enjoy the experience but you will also impress your friends. Once you get the hang of it you can make pasta in about 30 minutes. Mix 4 cups/400gr tipo 00 flour with 4 eggs. Pour the flour on a flat stable surface, I prefer the countertop, and create a well in the middle of the flour about the size of your fist. It should look like a squat volcano. Crack the eggs into a bowl to ensure that you don’t get any egg shells in your pasta. Pour the eggs into the well you have created in the flour. Add a pinch of salt. 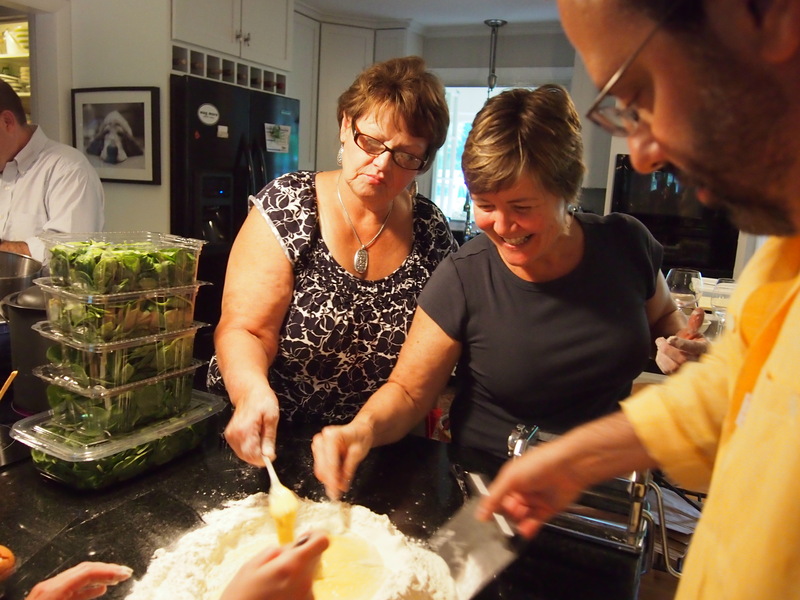 Carefully and slowly begin to whisk the eggs with a fork incorporating flour from the sides of the well. You can also pick up some of the flour between your fingers and slowly drop into the egg mixture from about 4 or 5 inches above – keep whisking. Continue doing this until the flour and egg mixture are well incorporated. If the well breaks it is ok just have a pastry scraper handy so you can keep pushing everything together. At some point you need to use your hands and knead the ingredients together. Don’t be intimidated. When you are finished you should have a ball of dough about the size of a baseball. Now you are ready to crank the pasta through the pasta machine. Cut the dough into four equal size pieces with your pastry scraper. Pat the dough flat so you can feed it into the opening on the machine. Rub with some flour so the dough doesn’t get stuck in the machine. Begin cranking the pasta through the machine with the setting set to the widest width. Do this about three times and then reduce the width to about half and crank through three or four more times. The pasta will get thinner and longer – you may need to cut the resulting strip (4 inches wide and possibly 18 inches long) of pasta in half at some point and then feed both halves through. Reduce the width again to the slimmest setting and crank the pasta through again a few more times. You will be amazed at how the pasta “grows”. 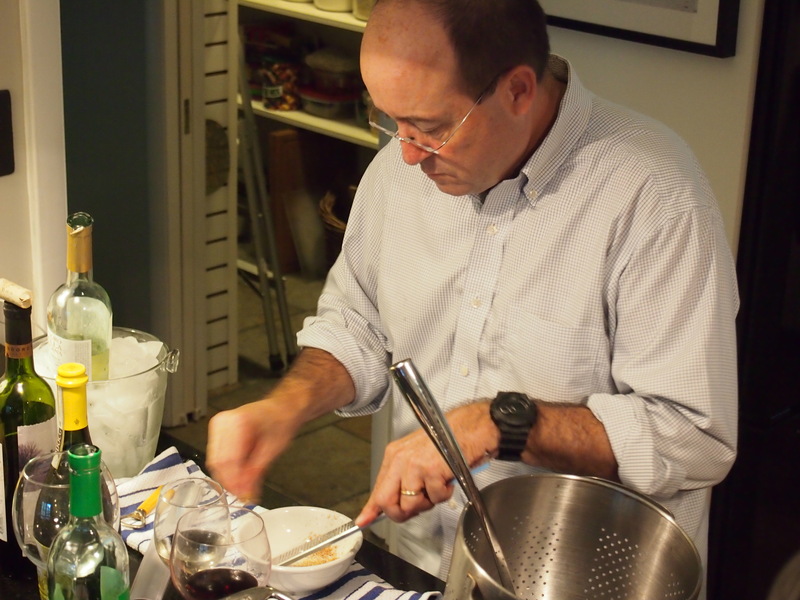 Andrea’s advice to me – “You know the pasta is perfect when it feels like a baby’s bottom” smooth smooth smooth. Once you achieve the desired thinness you can then use the cutting mechanism to make linguini, fettuccine, or spaghetti. 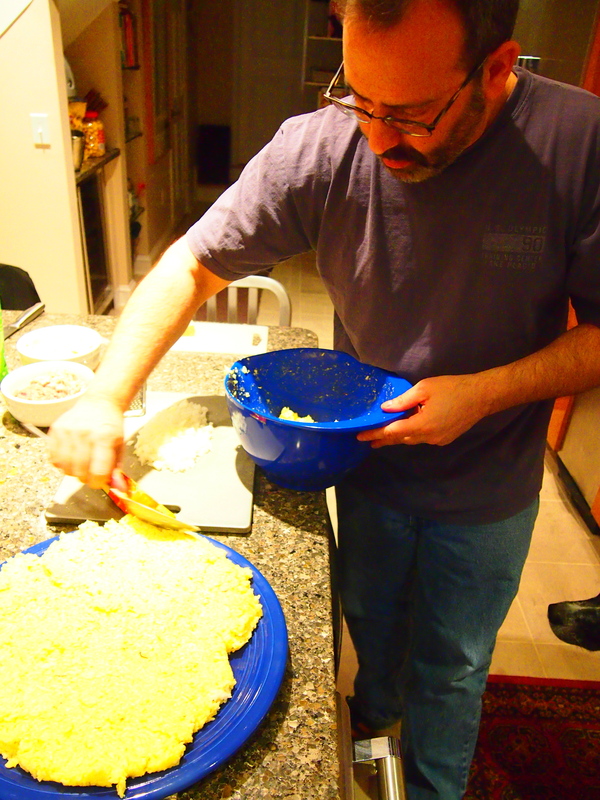 One secret that Andrea showed me – have a large plastic pan/tray filled with semolina flour to put the cut pasta into. You can then shake the pasta around gently in the pan and the flour will keep the pasta from sticking together before you cook it. Let the pasta sit and rest for few minutes before cooking, then put a large pot of boiling water over high heat. 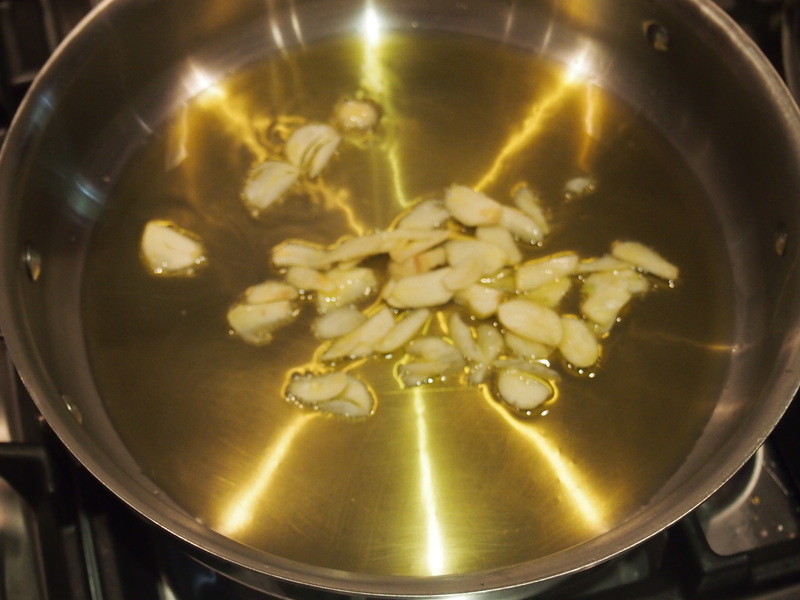 When the water is boiling, toss in a tablespoon of salt with the pasta. Stir to keep the pasta from sticking. Cook for a few minutes (1 to 2 minutes, fresh pasta cooks much faster than dried) until a piece of pasta tastes cooked. You are now ready to serve your spectacular effort with a variety of choices for sauce, Bolognese, Marinara, Alfredo, etc.